Jerseys | Professional Use Only, No Warranty. The Pittsburgh Penguins and Washington Capitals honored the late members of the KHL’s Lokomotiv Yaroslavl team tonight. The jerseys they wore featured the Lokomotiv logo on the right chest and a special patch on the inside hem. These jerseys are currently being auctioned off and all proceeds will go towards the Lokomotiv player’s children and families. The Vancouver Canucks opened up main camp today with a couple of sessions open to the general public. This was an excellent opportunity to catch a first glimpse of what equipment the players will be using during this upcoming season. The most significant change however, similar to the Toronto Maple Leafs, is the club now bears a patch on the right chest of their practice jerseys with the logo of their sponsor, Rona. 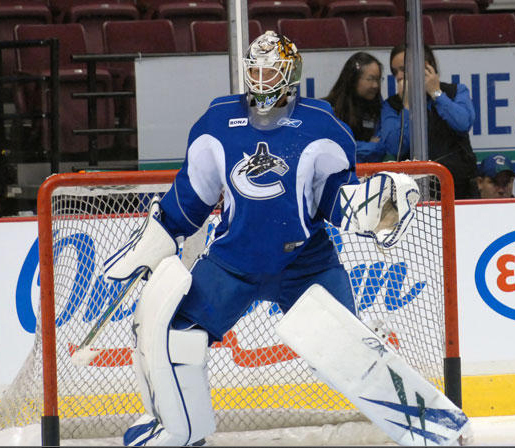 Eddie Lack (pictured below) is still sporting his familiar set of Brian’s Focus with the Lack (obviously) graphics. From what we can see it’s identical to the set he wore at last year’s training camp and pre-season. His attire essentially summed up everyone else skating at Rogers Arena today fairly well, not much has changed at all. With players being such superstitious creatures it’s not surprising the majority of guys at camp are also sticking to what they used last year after such a productive campaign. According to an article in the Toronto Star, starting today the Toronto Maple Leafs will be sporting a Purolator patch on their practice jerseys. It’s not the first time this has happened in the NHL but this sponsorship deal will bring in a new revenue stream for the club and we expect more teams to follow suit in the future. How would you react if the NHL permitted corporate sponsors to place advertisements on game jerseys as well? While it doesn’t sound like a very North American thing to do, AHL teams have had sponsor patches located on the right chest for years. While the Winnipeg Jets will not officially introduce their new uniforms until closer towards the season, stock photos of jerseys with the new Jets logo have already started to surface on eBay. We will still have to wait until they officially announce the jerseys to see if this is indeed the design they are going with. I am a bit skeptical about these auctions because the seller is relatively new, they are using stock images and the Reebok tag is blacked out. However the jerseys are still in line with what Chairman, Mark Chipman, described with the secondary “Wings” logo on the shoulders and the only red on the jersey being on the crest. We think they look good. Hope to see an updated version of the 1996 Jets jersey brought back as an Alternate in the 2012-2013 season. You are currently browsing the archives for the Jerseys category.